When I compare Ted Cruz to Donald Trump, I confess I lean toward Trump. 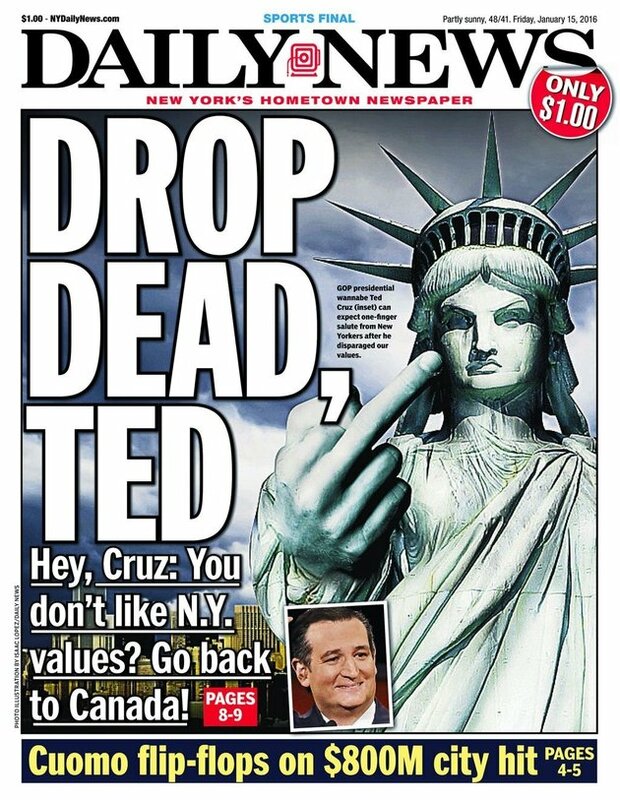 On the other hand, when I compare Donald Trump to Ted Cruz, I confess I veer toward Cruz. When I measure either or both aginst anything like a decent grasp of reality, to anything like sanity, well, fuhgeddaboudit. 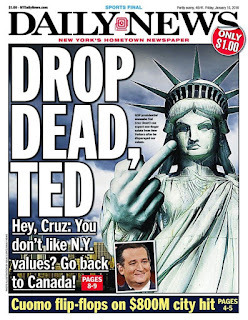 Still, I can't but like (not in the FB sense, either, but as in what one once meant by "dig") the Daily News retort to Cruz's utterly nutcase attack on NYC. Trump is a DIY militaristic, racist, billionaire, dictatorial, neo-fascist. Perhaps that covers it. Cruz is all the above minus the billionaire, and maybe the dictatorial. Instead, Cruz comes loaded with evangelical Christianity, which as he would brandish it would shut a secular democracy down. It does occur to me that Trump doesn't actually want to be president. Being president, unless you're Ronald Reagan, who proved otherwise, actually takes work. Trump may prefer to fall back into the arms of his lovely wife Melanoma, and play golf. After all, he's done his bit, marked the territory, left his scent. Let it be said, he defended NYC well against Cruz, using a tone of voice none have heard from him before, slow and compassionate. Maybe he should run for mayor. A mayor of New York can't actually instigate a war against Iran, or build a wall in Texas, can he? Mayor Trump could hole up in Trump Towers, and preside, like Sauron, mayor of Barad-dûr, from on high. But he better not take the subway or venture out to Brooklyn or Queens. Lotta Mexicans and other ethnics there. Cruz, however, really wants the job. Go Bernie, go Hillary. Go O'Malley, whoever the hell you are. no need to choose Harvey. We're getting both!